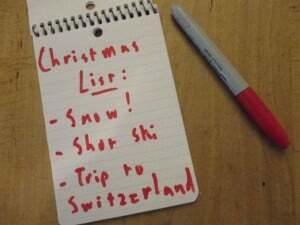 Well we clearly need to expand the list of things to do, so here are some more activities to keep the snow starved sane. We appear to be looking at a Christmas start through most of the region so let’s embrace that little known and oft neglected holiday. Work especially hard on your Christmas list—this is the year to go big. Your family should be very happy with you this year as you have not been squandering all the household money on endless ski trips. Perhaps your significant other has been unaware of the unusually crummy weather patterns (perhaps they are the kind of person who actually enjoys this sort of thing) in which case you should play it off as an act of virtue on your part and not a forced hiatus. So with all this earned good will you needn’t be bashful about padding your gift list a little. Unfortunately, none of this will work for me; I squandered all of Santa’s patience and a fair amount of goodwill by taking off to Colorado for five days last week, more on that later. Christmas decorating also makes an excellent activity for these tepid unseasonable days. So many of your treasured decorations probably had snow as an integral part of their design, of course the old and precious ones lost their flocking years ago and the sparkle has been rubbed off by generations of grasping little hands. Now they may look like twigs glued to old pecans rather than the snow flakes and Stars of Bethlehem they used to be, but nostalgia and fond memory bring them back to wintry life. My deep regret is that I have not built up my own collection of snow globes, as they stand up over time much better than your grandmother’s candy cane house, now much nibbled and faded. 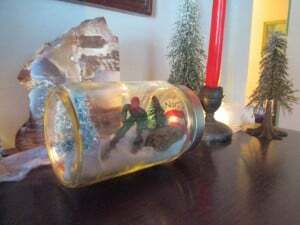 I plan on purchasing at least one snow globe a season to fill that gap because barring catastrophe, accident or maliciousness, snow globes remain indelible and always ready to bring a smile and a sigh, the snow only a shake away and forever immune to the vagaries of long range forecasting. 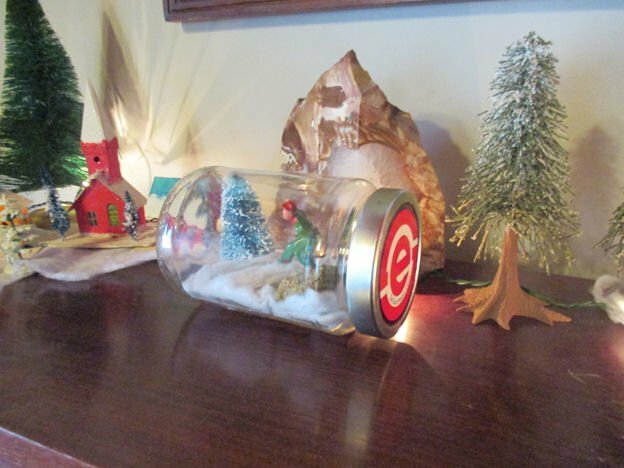 Upon my return from Colorado I felt inspired to make my own snow globe which might more aptly be called a skier-in-a-jar; whatever, it works for me. Maybe I’ll buy a real snow globe later today over at Santa’s Merry Megastore. 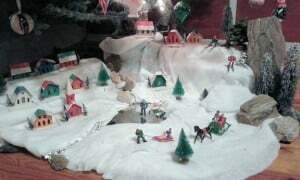 I also am proud to be the guardian of the small bedazzled cottages, painted iron figurines and odd chunks of rock, cotton and mirrors that were the scenes beneath the Christmas trees of my childhood. I think my parents’ intent was always a Currier and Ives type of theme, but my efforts of late have developed elements of a Powder magazine photo shoot. 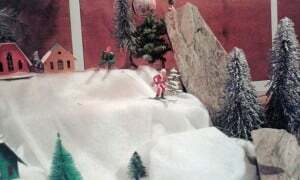 This year, considering the harsh realities we are facing I intend to make my yuletide village a place topped by deadly couloirs and precarious cornices extending way up into the tree; perhaps even as far as the blue spaceman with his foot broken off and the strange golden birds of unknown species. 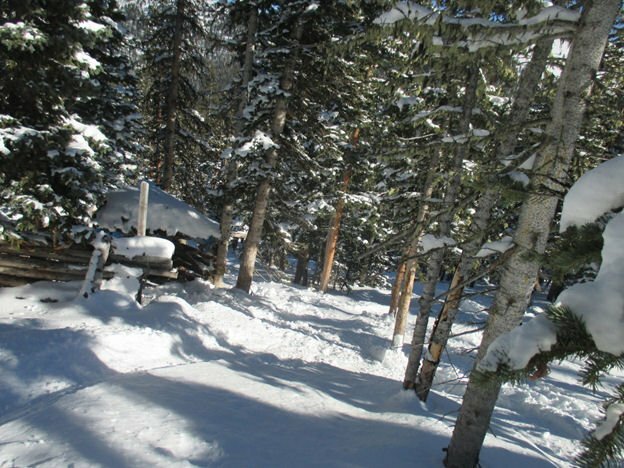 There is another and ultimate measure to be taken while waiting for the season here to turn around: flee, vamoose, skedaddle, take the coward’s path, get the hell out of dodge and decamp to someplace with snow. This is what I did last week. I’m not proud of it and I felt a bit like a deserter leaving my comrades to keep fighting the good and necessary fight, but that feeling faded pretty quickly; skiing deep natural snow has that effect. 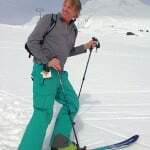 Anyway this was really a fact-finding mission undertaken for the benefit of us all, an act of benevolence if you will, so let me mention some advantages and tips I can offer about early season trips. If you can ever find last minute flight deals now is the time because there are not a lot of people doing vacation travel, everyone is waiting for their big Christmas trip which is when flights will be jammed and things generally get more expensive. Before that there are lower prices and fewer people, lifties have not yet grown surly and bartenders are of a more genial disposition. The locals have not yet taken up an us vs. them mentality, and peace and goodwill reign…. for the moment. Another way to always keep things cheap and pleasant is to remember the little guys, the family owned mountains that aren’t geared toward the destination dollars; most of these are operating on early season discounts on top of their markedly lower regular prices. Here are three of my favorites which are also the ones I skied this trip. Wolf creek through some kind of climate voodoo piles on huge amounts of snow while other places may still be struggling. It was one hundred percent open when I was there on December third. One of the best half days I’ve ever had. A half day makes a lot of sense especially at the high altitude and sometimes remote places in Colorado. Your lungs will thank you and if you have to drive a little further to come and go, the scenery makes the drive worthwhile. You can base yourself in a cool little mountain town like Salida and Georgetown as I did this time and actually find affordable motels; or even hostels if you’ve been missing your inner hippy (beware there may lurk telemarkers.) Also, because you are not booking a package you have freedom of movement and can go where the snow looks most favorable. A good planning tool in addition to the resort web cams are the live traffic cams that the Colorado Department of Transportation provides, CDOT, these can also give you some idea whether you actually need to make that upgrade to an SUV rental. By the way, car rentals are also ridiculously cheap at this time of year. 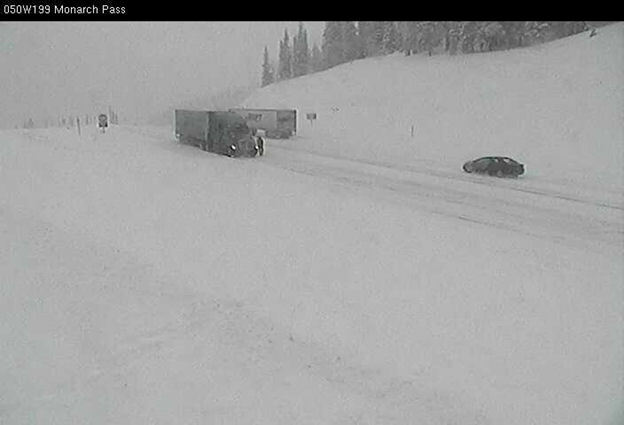 It was this CDOT image of Monarch pass last Sunday that inspired me to go. I guess some might look at that and think “Wow, I’m glad I’m not there!” but it had the opposite effect on me. 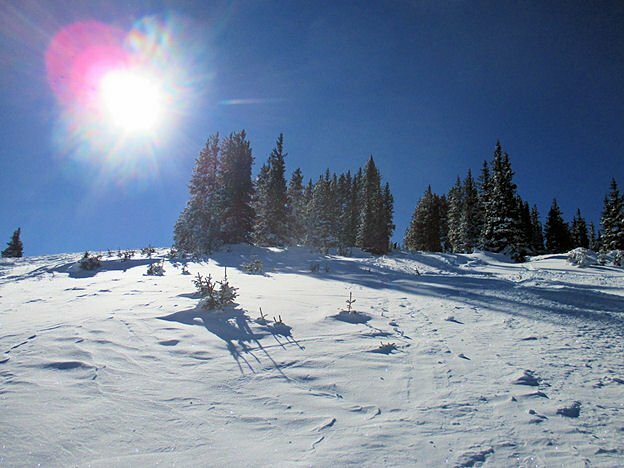 It turned out to be a beautiful bluebird day when I actually got to Monarch on Tuesday. 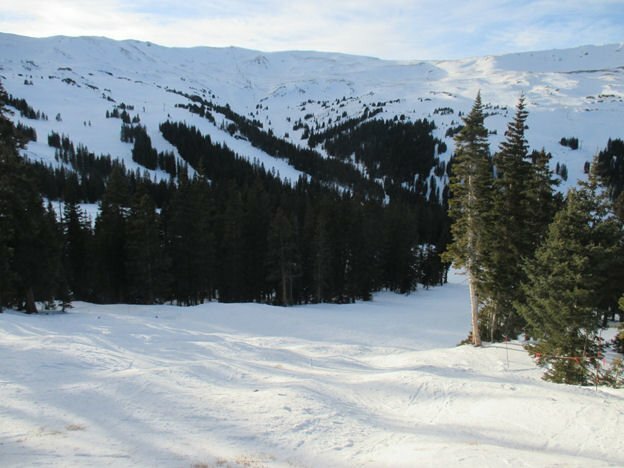 Loveland is another family owned place and like the others it is a ridiculous value with a much more laid back vibe than the big boys down the road. 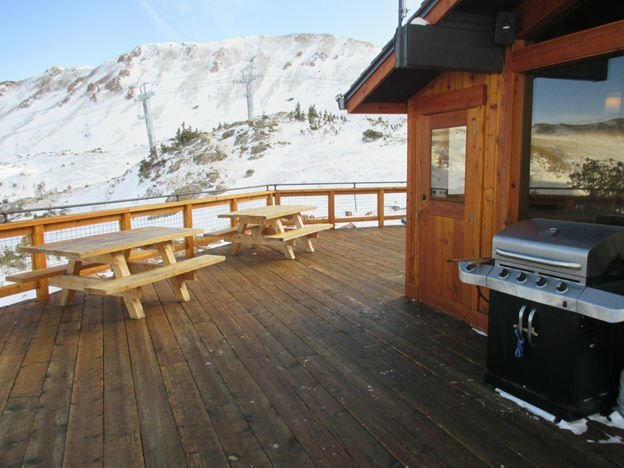 For example the café at the top of the new Ptarmigan lift will not only let you bring up your own food but provides a gas grill on its deck where you can cook it. You could probably haul up a live goat and the lift operaters would take a break to come and help you roast it. I guarantee they would on a full moon, there’s a definitely pagan feel to the place. Finally, you want to really save some bucks? 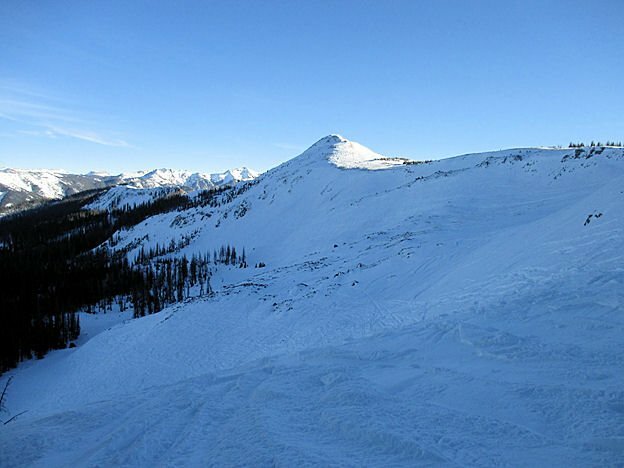 Don’t forget the back country, earn your turns…but that’s a whole other subject.